Korean fusion or ‘modern Korean’ is no new trend. 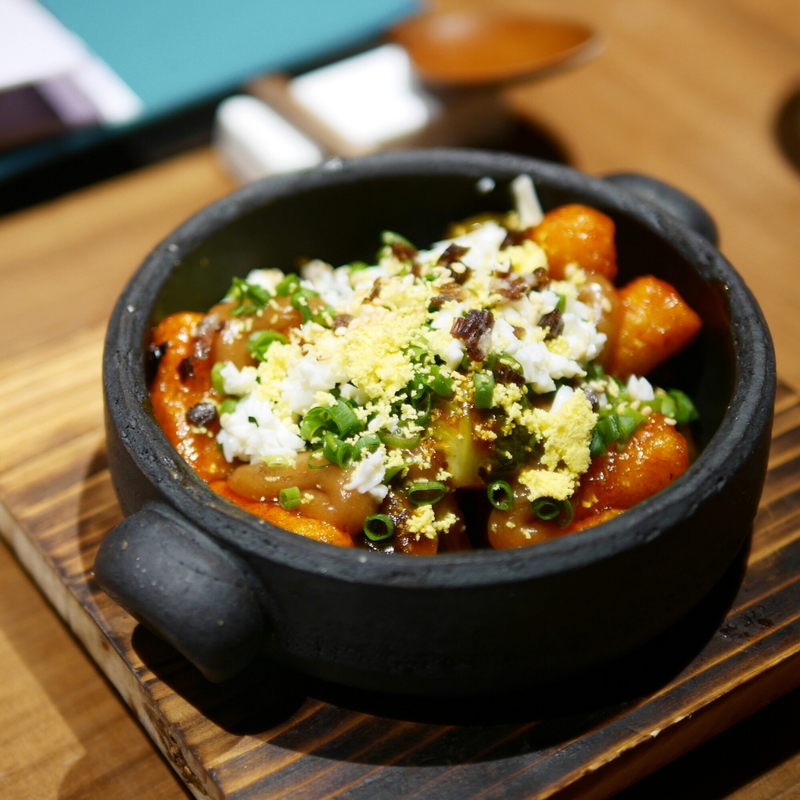 It was super hit about 1.5 years ago – that’s when I first tried Italian-Korean restaurant, Moyo – but the hype around kimchi-everything has definitely tapered off. 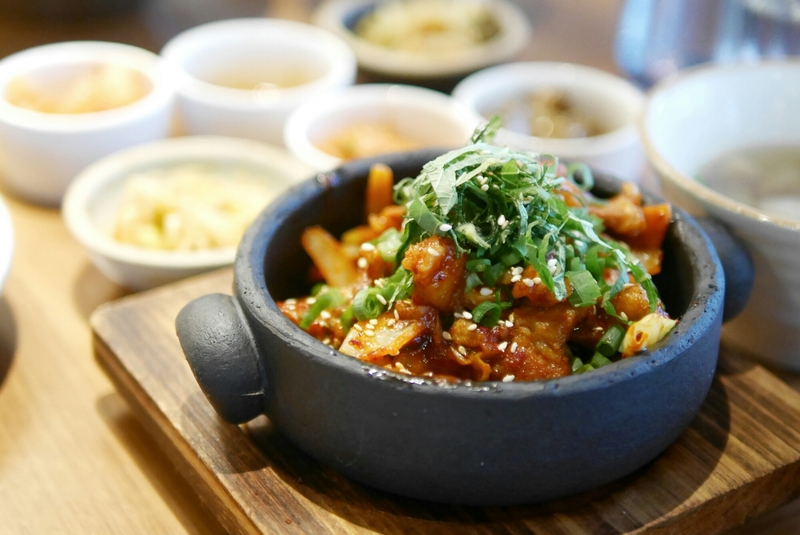 Fads come and go but Momojein’s creative take on traditional Korean flavours goes far beyond kimchi grilled cheeses, focuses on quality and is definitely here to stay. 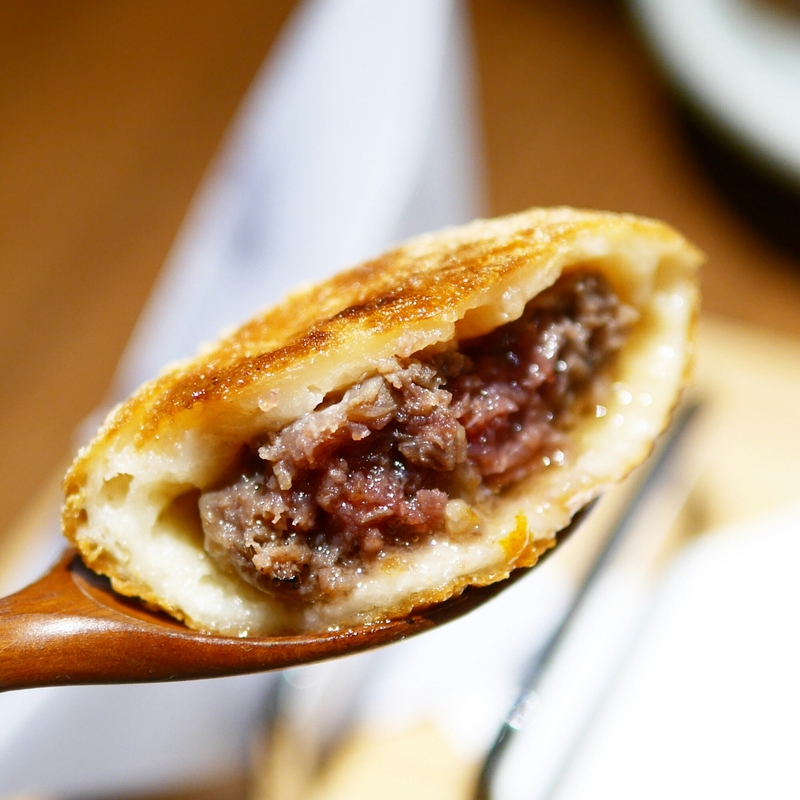 A Korean foodie friend has talked about Momojein since the day it opened last year. She’s eaten there about three times and kept urging me to try it. Finally I gathered some colleagues to go with me – in fact I ended up going twice in one week, for dinner then lunch. So let’s talk about both! I was a tad confused and disappointed when I arrived because the menu items didn’t match the recommendations my Korean friend had whatsapped me with. It turns out they had just launched their new menu which was almost completely revamped: their Season 2 menu. Unfortunately I can’t make comparisons to their original Season 1 menu. There were hits and misses, but overall the hits were pretty impressive. This item caught my eye first. It’s essentially Korean rice cakes, lightly fried and flavoured in that Korean spicy sauce, then mixed with Chinese peanutty “cheung fan” (a street snack – rice rolls) sauces. Brussel sprouts were also in the mixture. This worked so well together. It’s a bit creative but they don’t go overboard. So the flavours mesh together conservatively and perfectly. Having inspected the menu for at least 15 minutes, we were actually quite sure we didn’t want to order the Kalbi Hotteok. But when we asked for recommendations, the waitress could not emphasise less on how good this dish was. It’s the most popular item and is one of the few items they brought over from their old menu. I’m so glad we conceded because it was my absolute favourite dish here. The ‘crepe’ outer edge had a good starchy chew to it, kind of like a mochi. At the same time, the outside was fried perfectly – it had just a very thin golden layer of crisp. 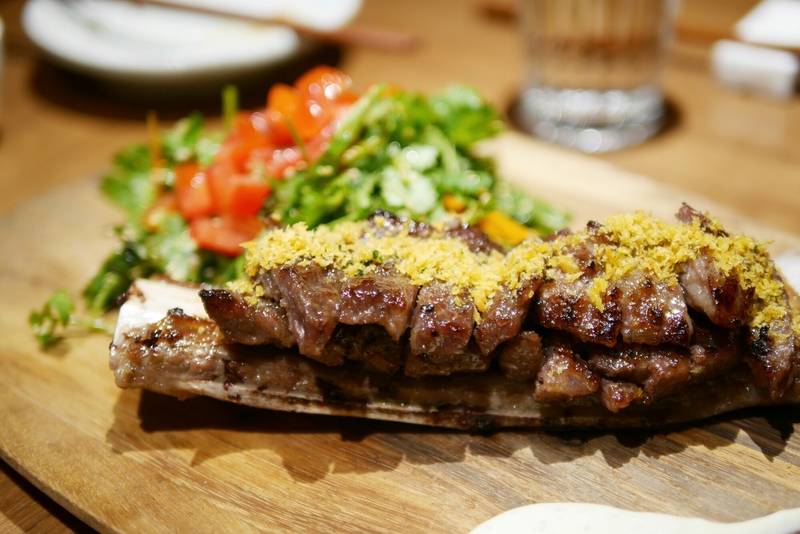 The inside was super juicy and the beef was flavourful too! There’s also a sauce to dip it in and that really added even more layers of contrasting flavours to the bite. Moving onto the larger main course dishes, the Kalbi was pretty tasty, especially when combined with the herbs and fried garlic. However, it wasn’t really creative or impressive. I was kind of duped by these ingredients and this was unfortunately an expensive mistake to order. 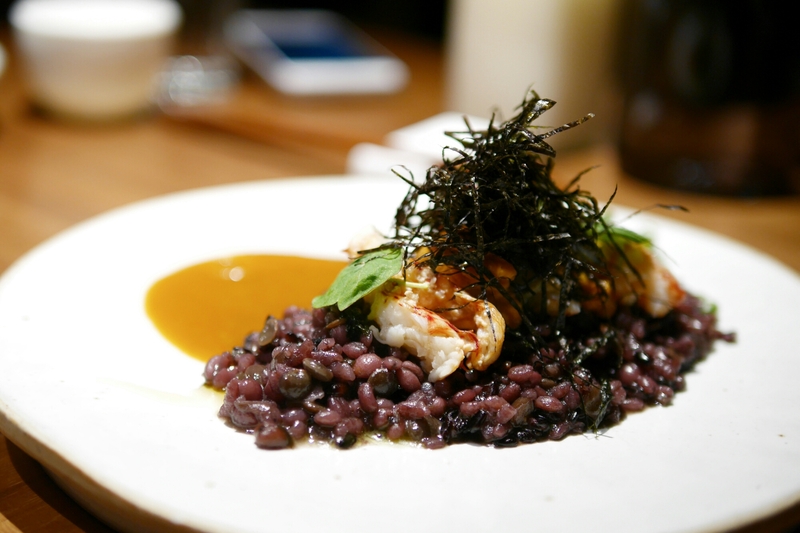 The “risotto” is comprised of different grains but the grain taste was too overpowering and ultimately I felt like I was eating red bean. The lobster and sea urchin pieces were not very generous or flavourful. They didn’t really add value to the dish. They kind of just got lost in the red bean flavour. There was also some shrimp bisque on the side, but that didn’t go very well together either. The colleague I had dinner with here had already tried out the lunch. I think the huge disappointment with the lobster & sea urchin risotto ultimately tainted our impression of the food here. Nonetheless, on proper reflection, everything else was actually really good. Since she said she preferred the lunch over dinner at Momojein, I quickly grabbed another colleague to trek over to QRE plaza in Wan Chai with me again one lunch time. Priced at around HK$100-140, their lunch sets aren’t exactly great deals. It includes a soup (an extremely tasty one), main course and tea/coffee. It’s still a safe choice as the dishes we tried were good, the seating arrangement is comfortable and service is speedy. I always fall for raw meat photos so their beef tartare bibimbap was one of the key triggers which brought me here for lunch. There’s no denying that the photos are appealing. While the bibimbap was flavourful and delicious, the beef tartare portion could be a tad more generous – there was so much rice! 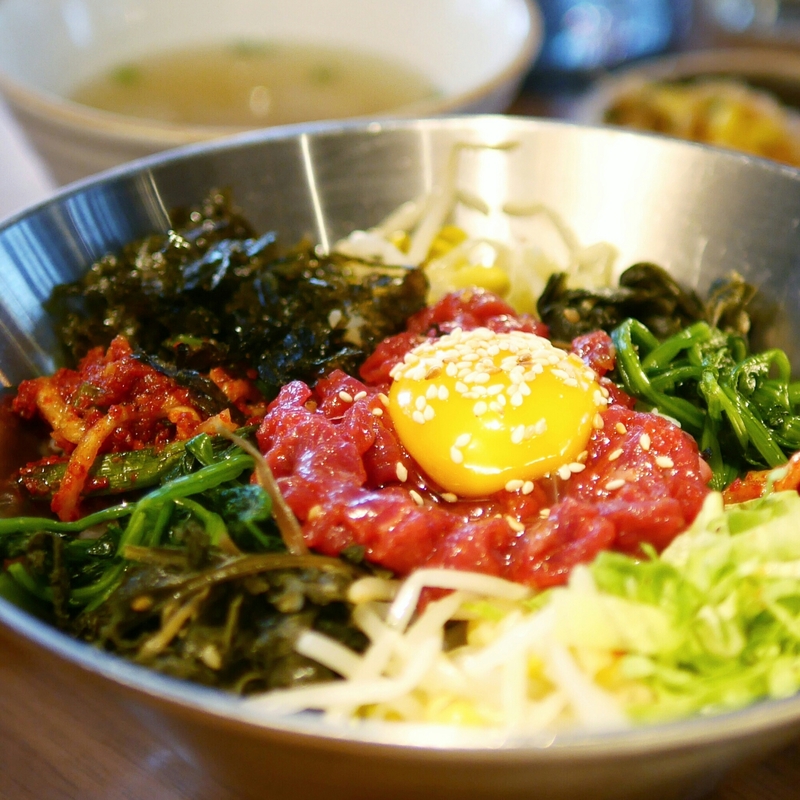 But more importantly, in reality, raw meat doesn’t have a lot of flavour, so the traditional bibimbap with cooked beef is actually much more flavourful. So that makes me strongly feel that sticking with traditional flavours is really fundamental. For example, while there wasn’t really any twist to the spicy pork belly (served with rice), it was just purely delicious. It had the perfect flavours and spiciness. They used good quality pork belly which was tender and juicy. The portion was also right. What I loved most about Momojein were their dishes which sported traditional Korean flavours, like that sweet spicy spice, yet still creative enough to pique your interest and curiosity. Admittedly, some dishes just didn’t work for me – the ones that perhaps strayed too far from tradition. Lunch was especially good because they were pretty organised considering how busy they were and we just couldn’t fault the traditional flavours.